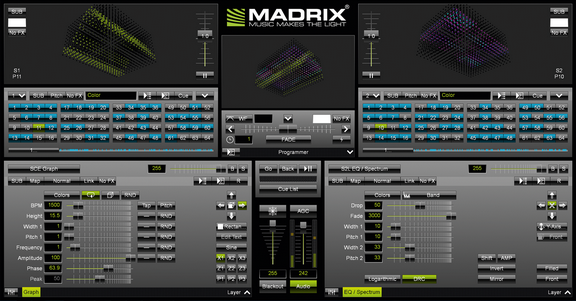 The user interface of MADRIX is arranged in a specific way. 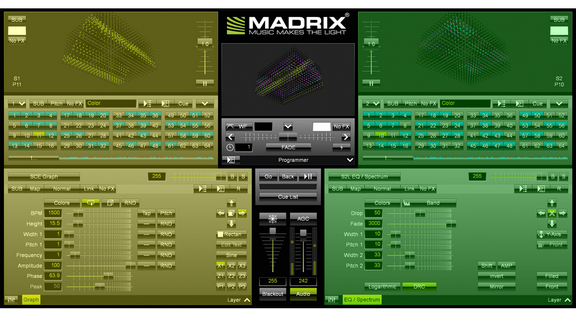 That means you can work independently on the left side or on the right side of MADRIX. You could compare this workflow with the A/B setup of a DJ. ▪ Your visuals are customized and set up in Layers. ▪ A Storage Place can contain one or multiple Layers. ▪ To use a variety of effects, you can use many Storage Places to store your visuals. ▪ Storage Places are organized in Storages. ▪ A Preview shows what current Storage Place is selected on the current Storage to preview an effect. ▪ The Crossfader and Master define the final output towards your LEDs. ▪ A Preview provides a live display of the currently used effects and lighting visuals. ▪ Different controls allow you to change visuals on demand for a whole pipeline. ▪ A Storage contains Storage Places to help you organize, manage, and store your effects. 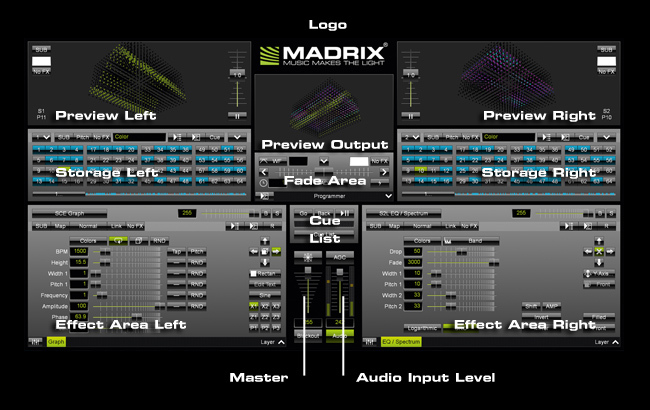 ▪ An Effect Area offers all the controls to choose and customize effects. Thanks to the features of MADRIX, you can flexibly work in many ways. ▪ Select an effect on the left side and put it out onto the LEDs. ▪ Prepare the next effect on the right side. ▪ Switch to the right side [using the Crossfader]. ▪ Prepare the next effect on the left side.